Hello everyone! This morning on Christmas Eve it is a beautiful -14 degrees with a thick fog rolling around and a peek of blue skies attempting to break thorough. I have been reminded time and time again this year of the magic in the darkest period of the year- and the magic in self care. While everyone seems to be scrambling to finish up last minute presents or cooking dinner, I find myself wanting to curl up in a cozy ball with a cup of loose leaf Yerba Mate and get lost in the mesmerizing glitter-like snow. When the temperatures drop, company is in abundance, and the stress of it all seems to be too much it is important to remember to step back and take time for yourself. Today I'm back with a new edition of my DIY Reusable Series with Guayaki to bring you some ideas to stay healthy, happy and cozy this Winter and Holiday Season. We all know that this time of year is the time cold + flu thrives. Being around so many extra people and germs can take a toll on our immune systems. If you have been looking for natural remedies to prevent and treat those pesky colds- well look no more! Elderberry may be your answer. 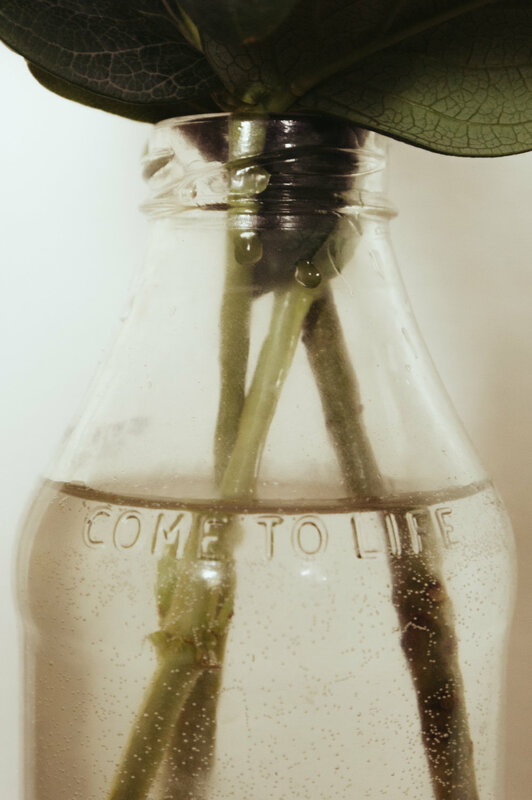 This beautiful plant that is native to North America is known for its immune boosting properties that have been used for centuries to treat and prevent the cold + flu. I suggest that you do your own research on the plant before making any further steps (here is a good article). Making Elderberry tincture during the wintertime has become a new tradition for me- and I personally can attest to how well it truly does work. Back in November Kal caught a rather gnarly cold. We both immediately started taking our daily doses of the tincture, and to our surprise I avoided contacting the sickness and Kal was symptom free within 3 days. Step 1: Fill your jar half full with the elderberries and other dried herbs. Do not pack down. Step 3: Label your jar with what ingredients you used and the date. Store in a cool/dry place for the next 3-6 weeks (depending on your desired potency) and shake daily. Step 4: Once you are ready to use your tincture, strain with cheesecloth and compost the herbs if desired. To pour the liquid into your clean shot bottles use a small funnel (trust me, you will waste more than you will receive if you do not use a funnel). Label each bottle, and use the original caps to store the extras, and put the small glass dropper into the first one you will use. The recommended dosage for adults is 1 dropper full (1/2-1 full teaspoon). Take daily and start to feel the amazing benefits that the remedy will give you. 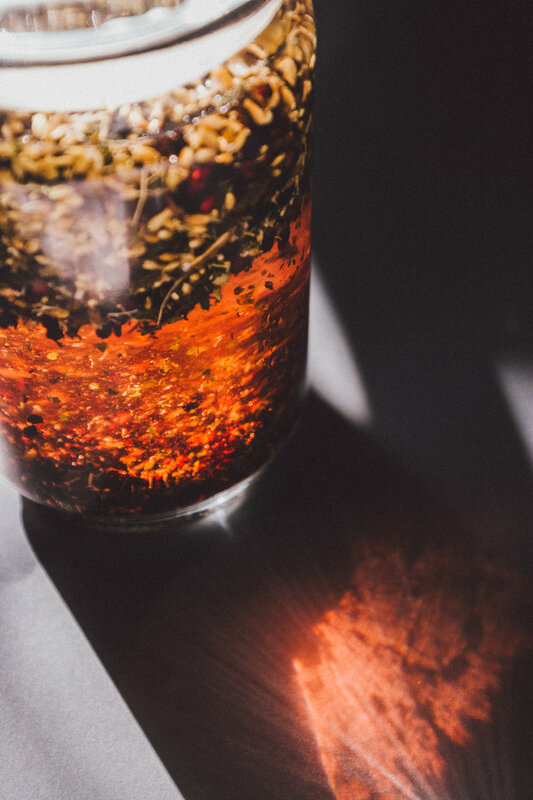 Make sure if it is your first time working with herbs, or creating an herbal tincture to do some prior research to avoid any kind of allergic reactions, health issues, and for further dosage information. Nothing helps me flow with the seasons more than decorating my apartment with hints of the current season wherever you look. As we know this time of year is especially the time for decorating and making your space cozy as we tend to spend much more of our time indoors during the winter months. Breaking those winter blues with greenery and other comfort items is essential to survive this brutal hibernation time. What better way to add some life to your space than with some holiday plant arrangements? 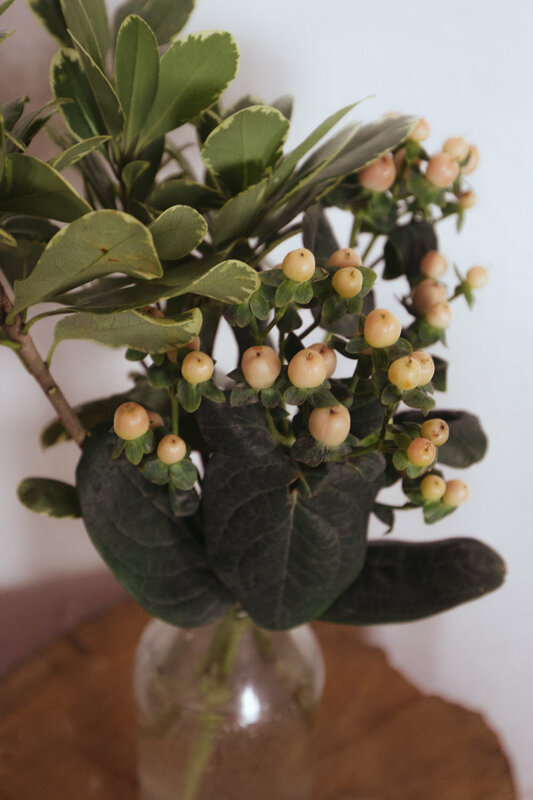 For this arrangement I picked up some Hypericum (St. John's Wort) and Variegated Pittosporum to create a beautiful bouquet. The 'come to life' Guayaki slogan embossed into the bottles makes a wonderful addition to the feel of this piece. I love reusing unique vessels to put greenery in- and Guayaki makes it easy after drinking a refreshing Terere. Looking for a new way to relax, have good conversation, and engage in a powerful ritual that involves drinking a warm beverage with friends and family around the holidays? You have come to the right place. Drinking Yerba Mate with loved ones is a very powerful tool to spark creativity, conversation and enlightenment. I think the description from Guayaki's website says it best, "Something magical happens when people share yerba mate from a gourd. For centuries people have sipped yerba mate using a gourd and bombilla. It is believed that drinking yerba mate from the gourd is a joyful way to receive the healthful and invigorating properties of yerba mate. The gourd provides a deeper and richer flavor as it becomes seasoned with each use. The mate gourd is offered as a symbol of hospitality and is peacefully passed from hand to hand around a circle of friends while ideas are shared, stories are told, and a sense of community is created. Yerba mate, te levanta el espíritu, lifts the spirit." 1) Fill the mate gourd with a daily serving of Guayakí Yerba Mate. 3) Insert the filtered end of the bombilla into the bottom of the gourd. 5) Add hot (no hotter than 150 degrees F.) water until it reaches just below the top of the yerba mate. Sip from the bombilla until all the liquid is gone, then add more hot water. The first few drinks are strong; the flavor will soften as more water is added for each drink. From Kenna: After you fill your gourd with hot water, add your cloves, cinnamon and elderberries on top of the Yerba and finish off with a heaping squeeze of OJ from your fresh orange. I topped it off with a fresh pine bow for some extra love. 6) Now that the gourd is prepared, drink it, add more hot water and serve your friends one at time in a circular fashion. Basically, pour, pass, sip. Let them know not to move the bombilla, as to not disturb the yerba. - Before using the gourd, read the curing and caring section. 7. The mate gourd can be refilled 15-20 times. I hope everyone enjoys the holiday and the remainder of Winter. Stay warm, stay cozy, and don't forget to 'Come To Life' with Guayaki Yerba Mate!